Now available in its 5th edition, Business Plan Kit For Dummies guides you through the ins and outs of constructing a great business plan. * Bonus online content including more than a hundred worksheets, surveys, customer profile formats, a business plan template, and more. One of the most amazing books... I was dreading the process of putting together a business plan, but this book with the accompanying disk make it an easy process!! "A real hands-on guide to putting together a business plan and then making it work." "The book is awesome and has really made me interested in strategic planning and decision making." "I'm from tech land and have never put together a business plan before. This book, and the forms are a nice gentle introduction to that process." "Whether you are building a business plan for your eyes only or for a project or a new corporation, this book is uniquely helpful in thinking things through...It is not difficult to understand. It is very appropriate." "I needed to prepare a Business Plan, and I needed to do it without spending a lifetime learning about it. This book helped me more then I thought possible. I only wish everything could be explained like this. I highly recommend it if a Business Plan is in your future..."
PLAN FOR SUCCESS with my creativeLIVE POWERFUL BUSINESS PLANNING 10-hour online course. To purchase follow this link. When someone asks about your business model, what they're really talking is how you plan to make money. Click to read about business models and how to develop one for your business. Your business plan needs to be grounded in reality, which means you need to know all the facts about the market your business serves, who will buy what you're selling, and whether your prospective market is growing, holding steady, or shrinking. This excerpt helps you get a handle on your market environment. This excerpt lists nine red flags that indicate the need for business plan revisions, whether to to ward off threats or to seize upon new opportunities. If your business is experiencing change, click for advice on how to adjust your business plan accordingly. *Commit to doing one thing well. Don't try to be all things to all people. Know your vision, mission, and the unique value you intend to deliver to customers. If any of those terms sound foreign, click on "FAQs" in the menu above to reach explanations. * Establish pricing, billing, and collection policies. From the get-go, know what you'll charge and how you'll collect. And remember, being cheapest is rarely a formula for small business success. Your pricing needs to be an accurate reflection of the value of your offering, and high enough to cover your costs plus an adequate amount of profit to keep you in business. * Designate a workspace even if it's in a corner of a room of your house. For advice about home offices, read Balancing work and life from a home office, an article I wrote for the Visa-sponsored BusinessBreakthrough program. 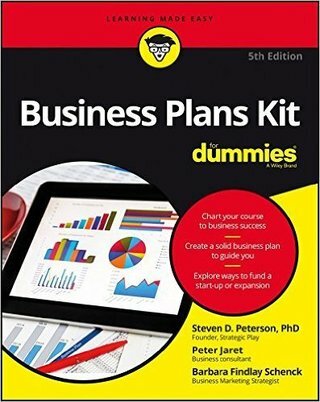 Business Plans Kit for Dummies book excerpts, links to articles and tips for writing and using a business plan. Excerpts from Small Business Marketing Kit for Dummies and tips to strengthen your marketing program. Excerpts from Branding for Dummies, branding interviews and branding tips and advice. A podcast and Q&A to help as you prepare for the sale of your successful business.